Upcycling, or repurposing used furniture is a great way to keep your lifestyle eco-friendly. It's also an excellent way to create some super fun new toys and other kid-friendly items that are low-cost, creative and unique. 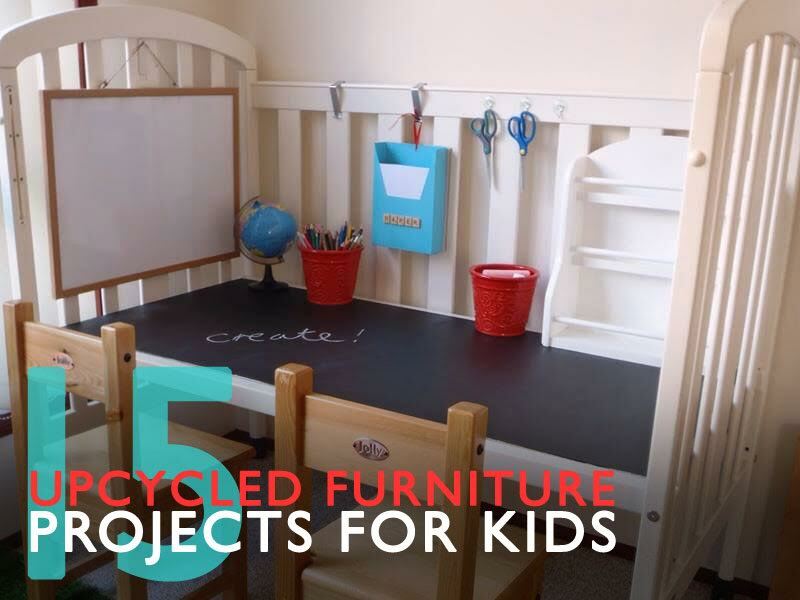 If you're feeling crafty and have an old shelf, crib or other furniture laying around, check out this round-up of awesome upcycled furniture designs for kids. 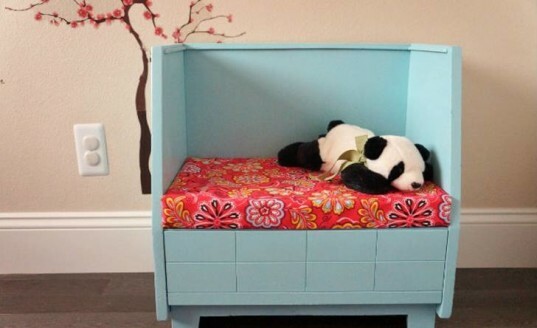 Play kitchens upcycled from older furniture is a favorite of DIY parents, but many are pastel or flowery, making them less suitable for little boys or girls in search of neutral colors. This play kitchen, however, is upcycled, modern and even masculine, plus boasts beautifully realistic stainless steel appliances and a wonderful mosaic tile back splash. 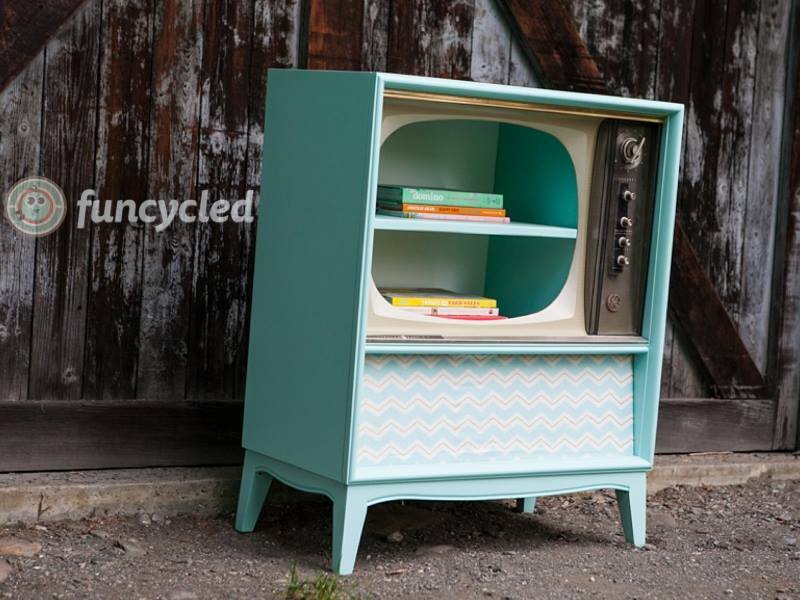 This cuter than cute retro TV turned into a sweet unique bookshelf is perfect for a child’s room and can be created in no time with fabric, paint and some new knobs. Changing tables help save parents’ backs, but there’s not much you can do with them when your little one outgrows diapers, other than store stuff on it. 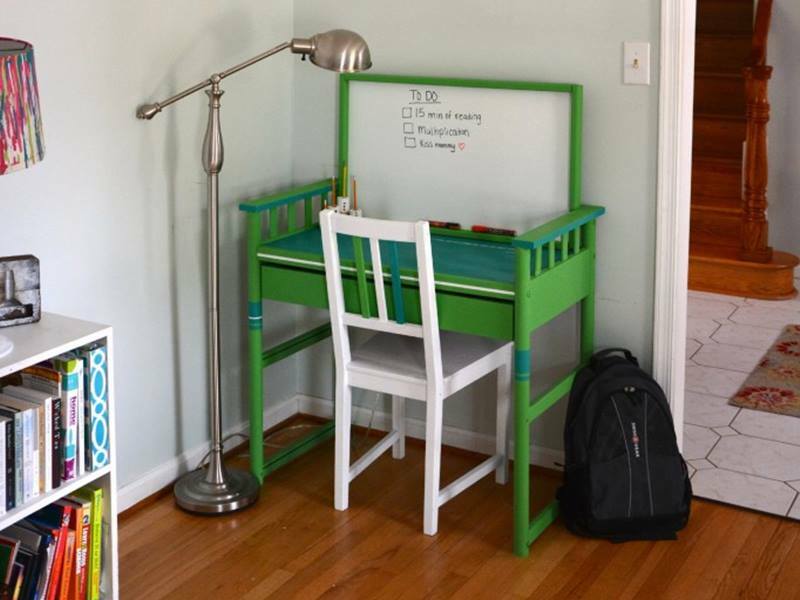 Luckily, this clever tutorial can help you turn an old changing table into a useful, super functional desk for your child that will last through the elementary years. 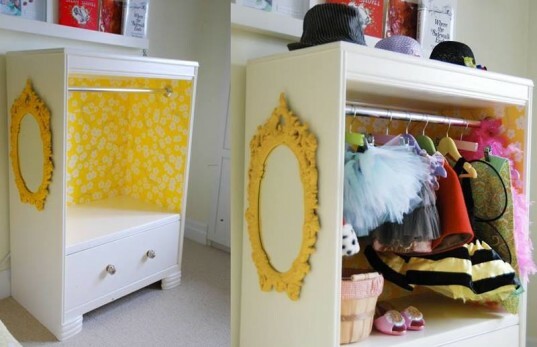 This adorable shelf makeover tutorial takes a boring piece of furniture and turns it into a wonderfully creative dress-up closet for a child. This is a good, simple project if you’re new to DIY projects too. What kid wouldn’t want their very own pretend diner? If a diner isn’t your kiddo’s cup of tea, think outside the box and create a lemonade stand, grocery store or pet boutique for your little one. Nanowo’s multicolored poufs are made from recycled cardboard spools and are a perfect play space and seating option for kids. However, you can’t find and buy them anymore, but you may be able to create some yourself with some recycled spools, colorful threads and a base covered with felt. Bonus, your kid can help you make this cool creation. 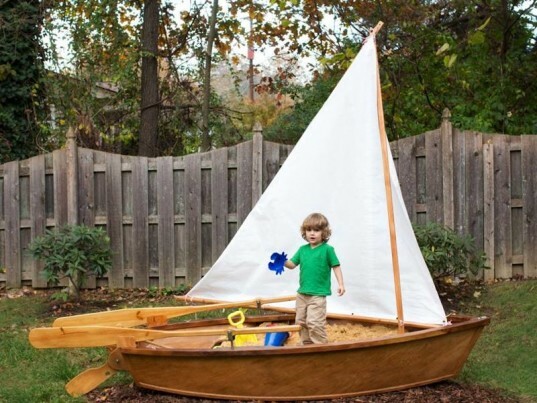 Ok, we know, a sailboat isn’t exactly furniture, but this awesome idea was too fun to pass up. Easy too. Simply fill a boat with sand and decorate as you see fit. Most little kids LOVE having their own set of tools along with a fun place to store said tools and build whatever they can dream up. 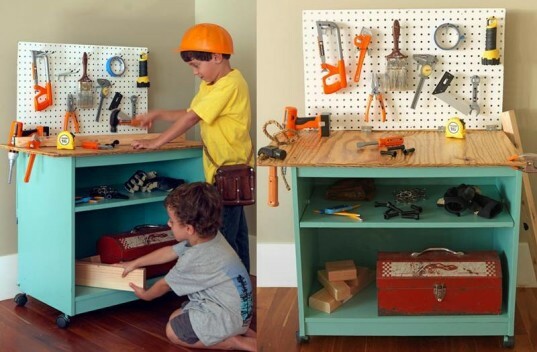 This tutorial allows you to make your child his or her very own workshop using an old bookshelf and some simple materials you can pick up at any home supply store or thrift shop. If you ever happen upon an old bench at a garage sale or thrift store, but it seems dingy, pick it up anyhow and refinish it into the perfect child’s bench and storage area. Plus, this is one of the easier DIY starter projects out there because the fixes are mostly cosmetic. You can totally make this adorable puppet theater from an old hutch or bookshelf, thus giving your child an open canvas for hours and hours of imaginative playtime. See how one mom took an old table from the attic and transformed it into a lovely and easy LEGO base play table that’s sure to be well-loved by kids and adults alike. Bookshelf dollhouses are hugely popular, and with good reason. First – how adorable! Second – how easy! 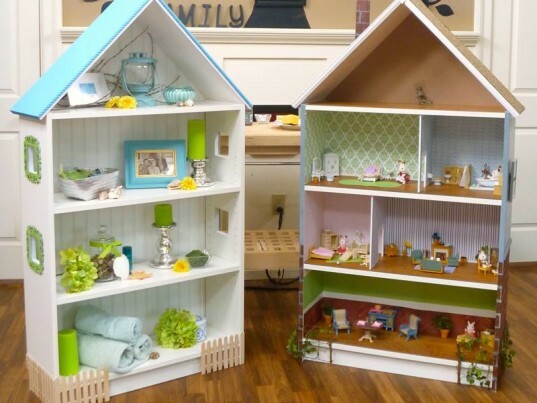 The sky really is the limit when it comes to bookshelf dollhouse variations. You can design a beach cottage and a brownstone house as shown above or go more traditional, create a castle, a farm or any other kind of kid-friendly dwelling for dolls you can dream up. Bonus, lots of the materials you’ll need are likely already in your craft supplies. 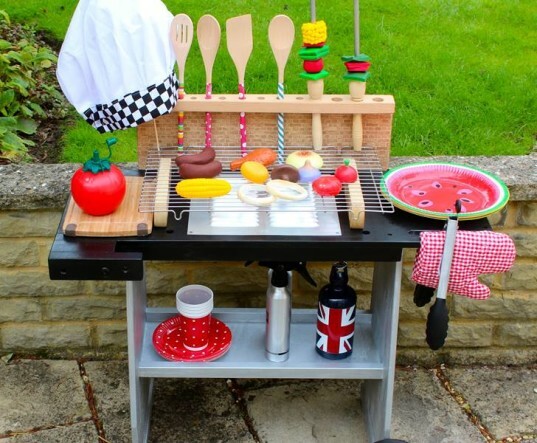 This mom repurposed a small thrift shop table into a brand new grill for her son, thus ensuring hours of outdoor creative playtime, and you can too. 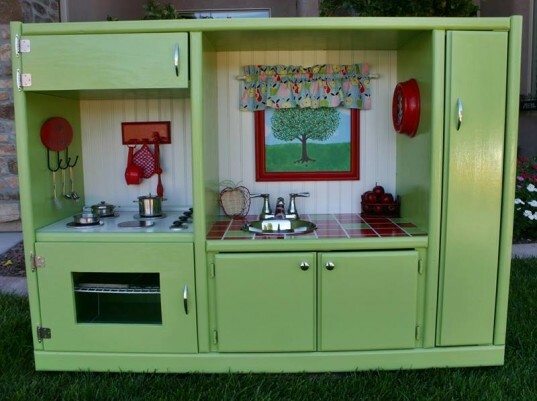 This play kitchen is another good example of just how extraordinary a basic shelf turned play kitchen can be. 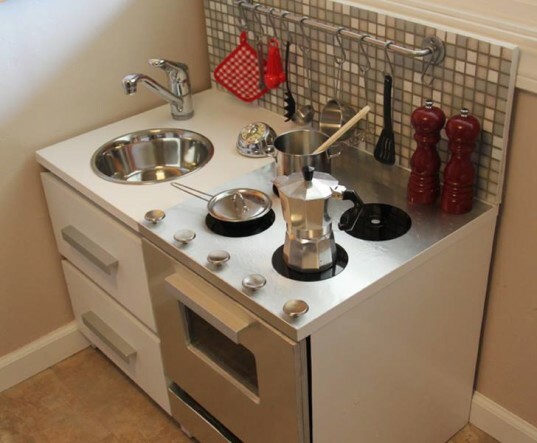 Not only is this kitchen big enough for more than one child, but it features tons of awesome details that make it really special and unique, like a real faucet, gorgeous tiles and extremely realistic burners. 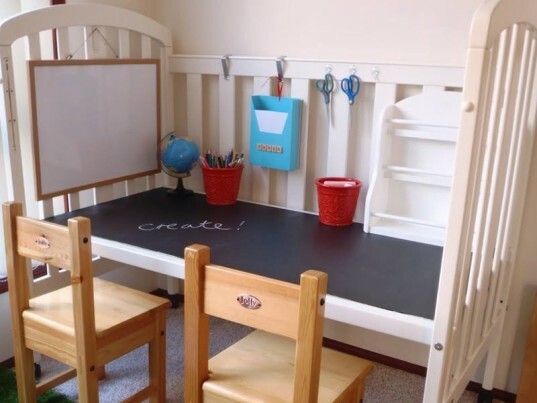 This desk is the perfect upcycle project for parents with an old crib on hand. Functional and inexpensive, we love everything about it, but especially the cool chalkboard table top. 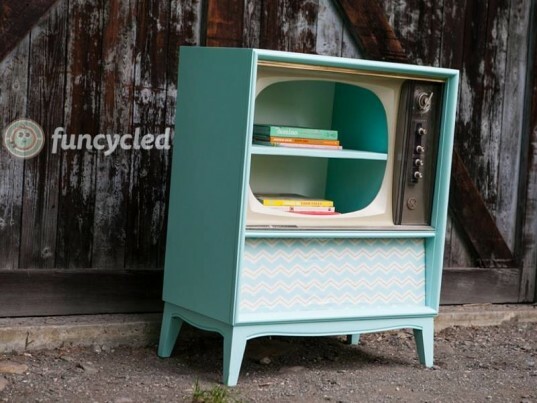 This cuter than cute retro TV turned into a sweet unique bookshelf is perfect for a child's room and can be created in no time with fabric, paint and some new knobs. Changing tables help save parents' backs, but there's not much you can do with them when your little one outgrows diapers, other than store stuff on it. Luckily, this clever tutorial can help you turn an old changing table into a useful, super functional desk for your child that will last through the elementary years. This adorable shelf makeover tutorial takes a boring piece of furniture and turns it into a wonderfully creative dress-up closet for a child. This is a good, simple project if you're new to DIY projects too. 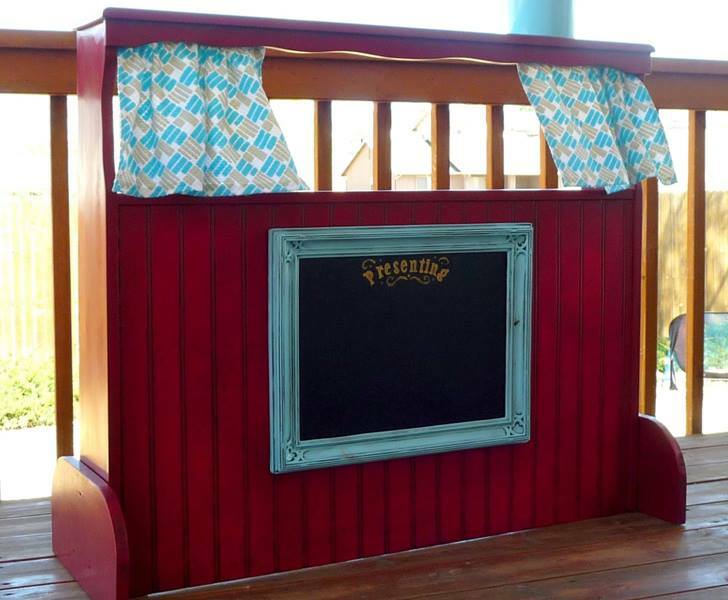 What kid wouldn't want their very own pretend diner? 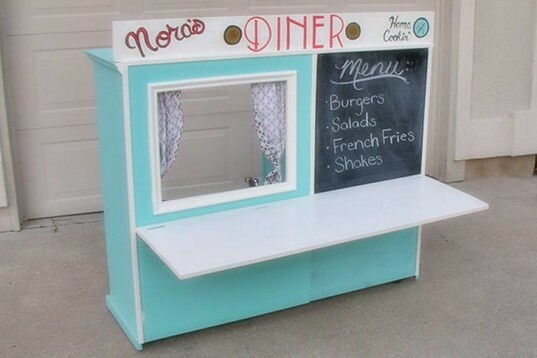 If a diner isn't your kiddo's cup of tea, think outside the box and create a lemonade stand, grocery store or pet boutique for your little one. Nanowo’s multicolored poufs are made from recycled cardboard spools and are a perfect play space and seating option for kids. However, you can't find and buy them anymore, but you may be able to create some yourself with some recycled spools, colorful threads and a base covered with felt. Bonus, your kid can help you make this cool creation. Ok, we know, a sailboat isn't exactly furniture, but this awesome idea was too fun to pass up. Easy too. Simply fill a boat with sand and decorate as you see fit. If you ever happen upon an old bench at a garage sale or thrift store, but it seems dingy, pick it up anyhow and refinish it into the perfect child's bench and storage area. Plus, this is one of the easier DIY starter projects out there because the fixes are mostly cosmetic. 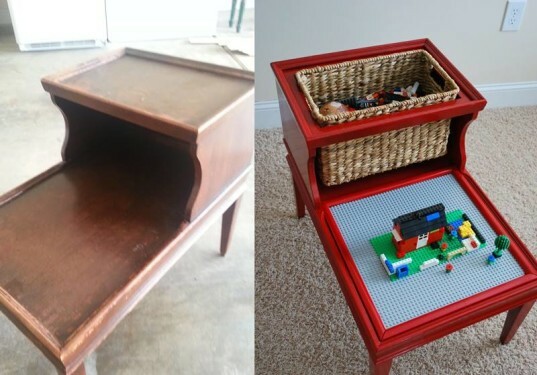 See how one mom took an old table from the attic and transformed it into a lovely and easy LEGO base play table that's sure to be well-loved by kids and adults alike. Bookshelf dollhouses are hugely popular, and with good reason. First - how adorable! Second - how easy! The sky really is the limit when it comes to bookshelf dollhouse variations. You can design a beach cottage and a brownstone house as shown above or go more traditional, create a castle, a farm or any other kind of kid-friendly dwelling for dolls you can dream up. Bonus, lots of the materials you'll need are likely already in your craft supplies.